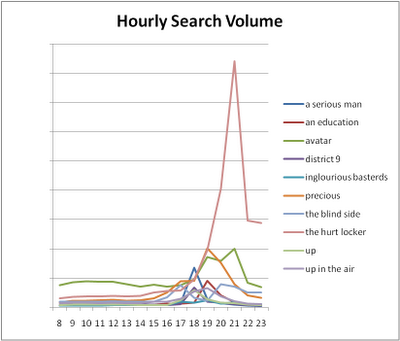 "THROUGHOUT THE NIGHT Oscars-related searches rose and fell as nominations were introduced and winners announced," Qing Wu, Senior Economics Analyst at Google Search, wrote on a blog post. Wu listed the terms which people used to search in Google. What's in it for bloggers and writers? Keywords. Keywords are an important element in search engine optimization (SEO). Putting the right keywords in your blog posts and articles about the recently held 82nd Academy Awards, more commonly known as the Oscars 2010, will land them in the first pages of search engine results page (SERP). If you are writing about the Oscars like the Oscars 2010 nominees, Oscars 2010 winners, fashion and glamour in the 2010 Oscars, Oscars 2010 best picture, Oscars 2010 best actor and best actress / best supporting actor and best supporting actress, or anything Oscars-related, then you have to take Wu's clues. The last two are unusual, eh? So, I say, GOOG luck on your SEO efforts.